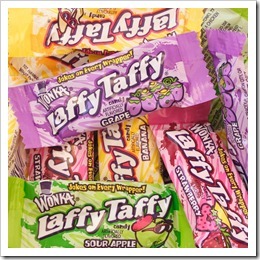 The Laffy Taffy is a type of taffy candy, which is made by Nestle. The company brand that sells this product is the Willy Wonka. The beginning of this type of candy can be found in the 70’s. Its size is on the small side (it has around 45 grams) and it’s a taffy candy that is wrapped individually. It comes in a number of flavors, including the chocolate mousse. The Flavor Flippers are a candy that was launched in 2003, by Wonka. It has a center that is soft, and of a different flavor than the rest. The name of the candy is both about the fact that it’s a silly candy (it comes with jokes in the wrapper) and about the fact that it has a taffy texture. One example of a joke that comes in the wrapper is “What is the name of a cow that has no legs? It’s ground beef.” The jokes that come on the wrapper come from kids that are mentioned on the candy’s wrapper. In the beginning, the Laffy Taffy came in the form of a square and thick shaped piece, but now it comes in rectangular pieces that are thinner. 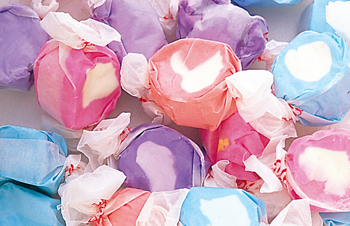 Taffy candy usually has artificial flavors inside. The ingredients of the Laffy Taffy are salt, artificial flavor, soy lecithin, malic acid, hydrogenated cottonseed oil, diglycerides and monoglycerides. These are all substances that account for less than 2% of the Laffy Taffy candy. Other substances included, which vary, depending on the flavor of the candy, are Red 40, sugar, Yellow 5 and Blue 1. 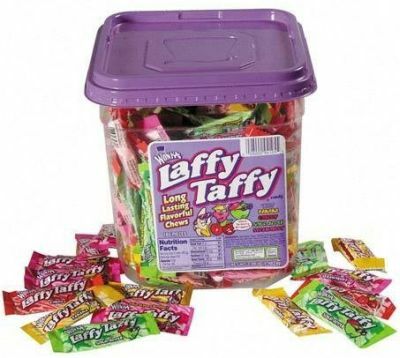 If you’re from the US, you probably know that the Laffy Taffy is one of the most popular chewy candies in this country. 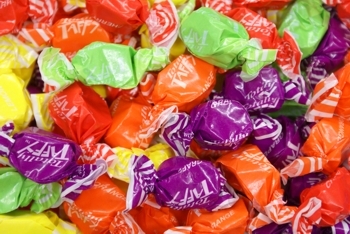 Outside the US, the taffy candies are also known as toffee. This candy is sticky, sweet and both small and big kids love it. The Laffy Taffy’s history started in 1971. At the time, they were created as a movie tie-in, for a film that was launched during that year. Laffy Taffy remained even after the launch of the movie. The wrappers of the candy had a joke inside. The intention here was to make the word Laffy associate with laughing. The jokes from the wrappers were sent in by kids. The company chose the best jokes and put them on wrappers of the Laffy Taffy. This type of candy wasn’t invented with the Laffy Taffy. Its history dates back to the beginning of the 19th century. People don’t know if the country of origin is France, Scotland or England, but they know that 1817 was the year when the word taffy was first written. The version of taffy from Scotland was also known as a tablet, since the candy was so hard that you needed a hammer to break it. The current version of the classic taffy, which is chewy and soft, has come around in the middle of the 19th century. This candy was easy to make and wax paper was used to wrap it. In the 1870’s, taffy pulling was enjoyed by people and it even was a social event that was popular. Right now, this candy is sold in flavors like grape, chocolate mousse, blue raspberry, banana, sour apple, cherry and strawberry. With the release of the new Willy Wonka movie in 2005, the taffy candy became popular once again.